The Village Ride is a mountain biking only trail located in the Matthews/Winters Park near Denver, Colorado. From the trailhead near the junction of Highway 93 and Interstate 70 the Village Ride trail crosses the scenic Mount Vernon Creek and makes a gentle climb that takes it in the direction of Red Rocks Park. The trail is often combined with the Red Rocks trail and the Cherry Gulch and Morrison Slide trails to create longer mountain biking routes. The Village Ride trail begins on the east side of the Matthews/Winters parking area. There is a spur trail on the left at this point that connects the Matthews/Winters parking lot with the Stegosaurus Lot that is on the other side of Highway 93. The spur trail comes in handy for those wanting to ride a long loop that includes the Dakota Ridge trail. As the trail starts out it descends from the parking area down toward Mount Vernon Creek. At the bottom of the hill there is another short spur trail that runs over to the restrooms. A well built bridge and boardwalk ferry the trail across the creek and over a spot that is sometimes swampy. After crossing the creek the trail begins a gradual climb that takes it up and around the side of a hill. The trail levels off a bit as it contours around the top of the hill. Eventually the trail meets up with the Red Rocks and Village Walk trails and comes to an end. 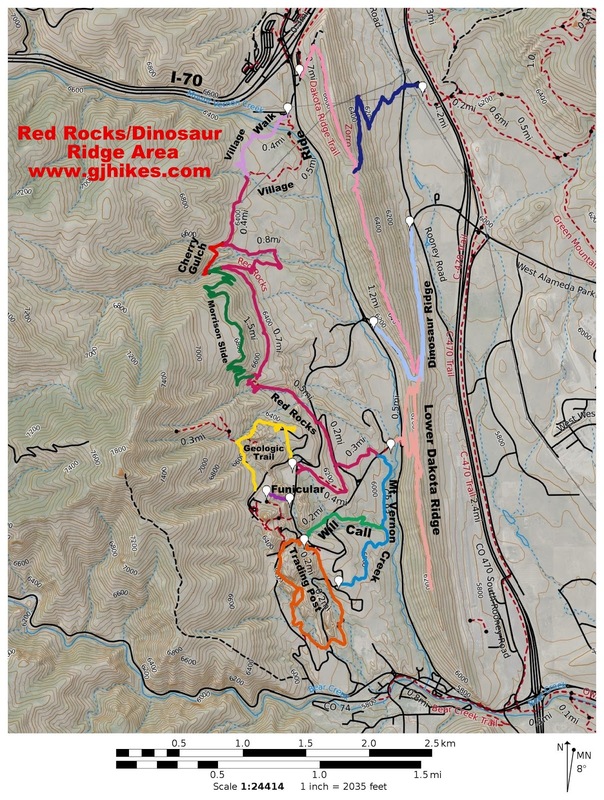 Loops of various sizes and difficulties can be created by combining the Red Rocks, Cherry Gulch and Morrison Slide trails. The Cherry Gulch, Morrison Slide and Dakota Ridge trails all have a 'Most Difficult' rating. If you want to keep everything in the Intermediate area you can stick to the Red Rocks trail and maybe throw in some pavement to make a loop. The parking lot at the Matthews/Winters Park can fill up at times on weekends making the spur trail over to the Stegosaurus Lot even more useful. All of the trails in the Matthews/Winters Park are open to mountain biking with the exception of the Village Walk trail. The map on this page should come in handy to help engineer the type of ride you would like. 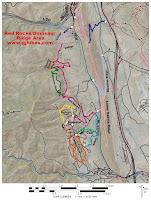 There are usually free maps available at the trailhead but they don't include the trails in the Red Rocks Park area.